From 1882 to 1981 the public university in Monmouth, Oregon, known today as Western Oregon University, was devoted to training men and women to become elementary and secondary school teachers. Many young women attending the Oregon Normal School (ONS) in the late 19th and early 20th centuries came from humble, rural backgrounds. For these students, participation in extracurricular activities during their school days was crucial. Through campus-wide and club events, rural women gained experience in a new social realm, which would help them succeed as educators and women in the progressing American society of the early 20th century. Like many other new Oregon Normal School students, Marbas came to school full of excitement and determination, but with little experience in academic or high-society settings. The American Yawp states in the chapter, “The Progressive Era,” that the leading powers in social reform movements of the early 20th century were clubs made up of upper- and middle-class, educated women. There was no place for “frontier girls” within these social networks. In order to become influential women and educators, normal school students needed to gain skills and experience that would allow them to fit in with women’s clubs, parents groups, and potential school donors. Karen Blair’s article, “Normal Schools of the Pacific Northwest” informs us that normal school students were encouraged to participate in extracurricular activities. 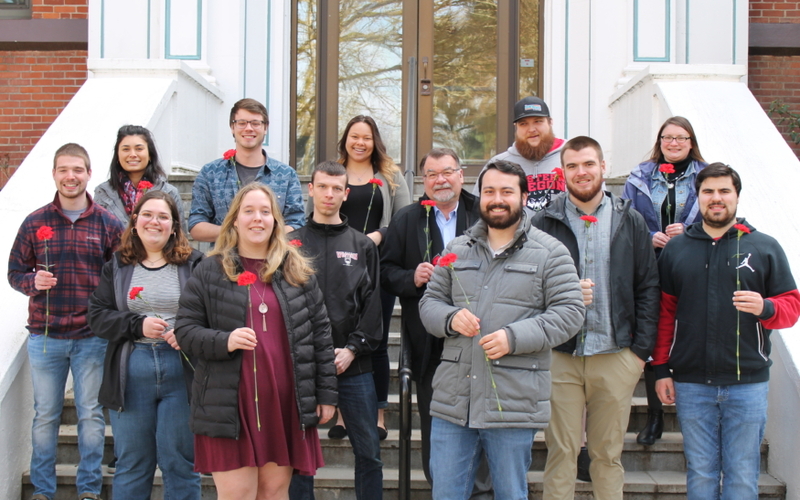 Occasionally students participated in university-wide events, but the primary extracurricular opportunities came from university literary societies. At ONS the Vespertine and Delphian Societies were made up of young women, and the Normal Society was the club for young men. Extracurricular activities won normal school students’ respect in the public eye through community events, volunteer work, and newspaper articles. Through these experiences students developed skills that would help them succeed in community engagement and social reform. The skills and reputations that young women gained through extracurricular activities at Oregon Normal School, especially involvement in literary societies, sent them into their adult lives prepared to make a positive difference, by improving the quality of education and contributing to the advancement of women in society. 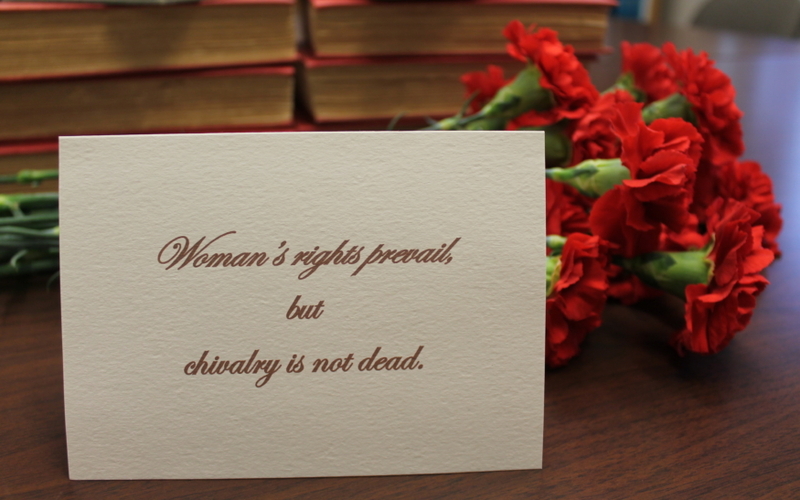 During the turn-of-the-century reform era, women fought for and won the right to vote and gained a more influential role as full citizens. With their new influence as voters, women sought to improve conditions for themselves and society as a whole. One area that needed improvement was public education. Gary Jensen and Jerrie Lee Parpart’s Oregon Encyclopedia entry, “Western Oregon University” and Blair’s article give evidence that high quality schools and teachers were in low supply in Northwestern states in the early 1900s. 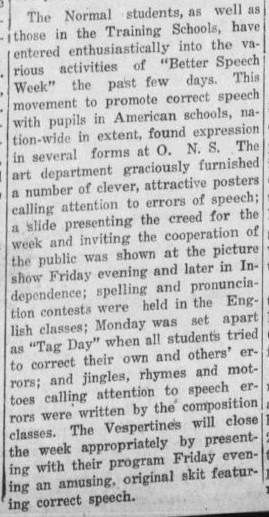 In 1911 newspaper articles were published throughout the state of Oregon drawing attention to the short supply of trained teachers and advertising Oregon Normal School for recruitment and support. As public education developed and young men and women answered the call for teachers, funding for public schools and universities became a recognized issue. These societal circumstances provided female teachers with a position to influence the conditions of the education system and women in the communities where they taught. “Items of Interest at Oregon Normal,” Monmouth Herald, April 2, 1920, 1. “Items of Interest at Oregon Normal,” Monmouth Herald, April 23, 1920, 1. In May 1920 Oregon voted on a “millage bill,” which, if passed, would increase property taxes to enable more funding for education. At this time the Oregon Normal School did not have enough space to house and teach the many aspiring teachers enrolling each year. ONS and schools around the state desperately needed additional funding. 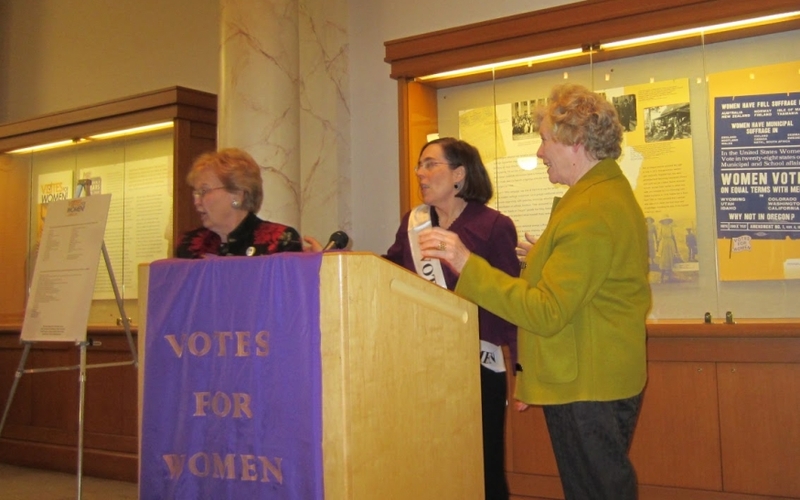 Activities at ONS surrounding this bill give an example of young women in Oregon playing a role in political decisions. Almost all of the eligible students at ONS were registered to vote so that they could support the tax increase, and students were encouraged to promote the bill by campaigning for it in their hometowns over Easter Holiday. The bill passed with strong support. 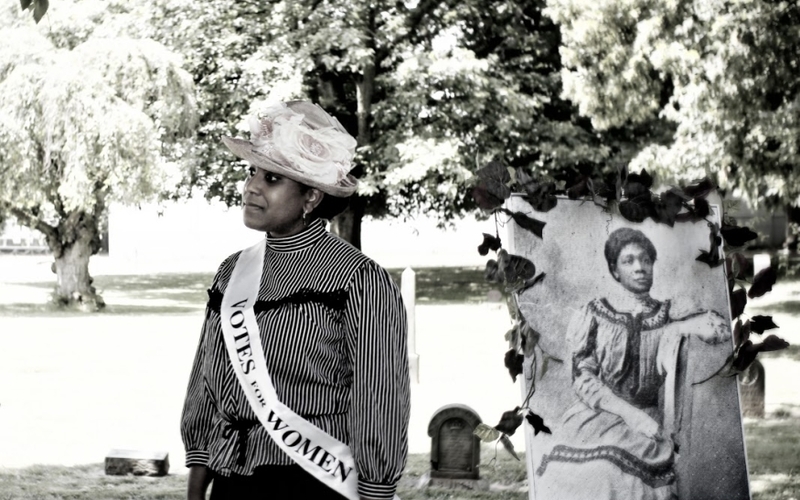 Experiences like this one taught young women the importance of civic engagement, showing them the amount of influence they could have through political awareness and advocacy regarding issues that were important to them. 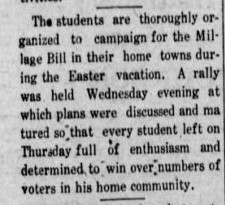 “Normal School Notes,” Monmouth Herald, March 22, 1912, 1. For Saint Patrick’s Day in 1912, the Delphian literary society hosted the school faculty, the Vespertines, and the Normals for a celebratory function. The following Friday the three societies took part in a debate on the subject, “resolved that municipalities should own and control their water, light, and transportation systems.” In addition to celebrations and debates, literary societies organized special programs centered around volunteer work. Blair notes that literary society members participating in social work were inspired by feelings of responsibility to improve the world around them. Women’s participation in these special events helped them develop confidence and comfort in social settings and instilled in them lifelong commitments to learning and bettering society. These actions, skills, and values won esteem for aspiring teachers from the community. The coupling of these skills and esteem would allow women to have greater influence on their communities as adults. “Normal School Notes,” Monmouth Herald, November 3, 1911, 1. 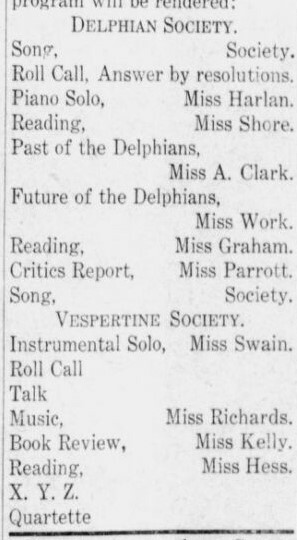 In addition to planning and partaking in special events, literary societies held regular programs. Throughout the year the Delphian and Vespertine literary societies held regular programs twice a month on Fridays. The first meeting of a school term included elections of group leaders and welcoming of new members. 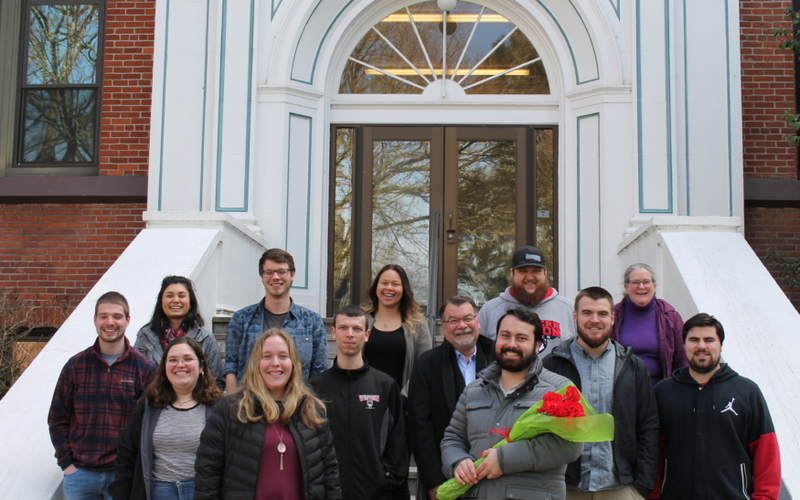 Throughout the year regular programs gave society members opportunities to showcase skills, engage in intellectual discussion, and get acquainted with formal meetings. 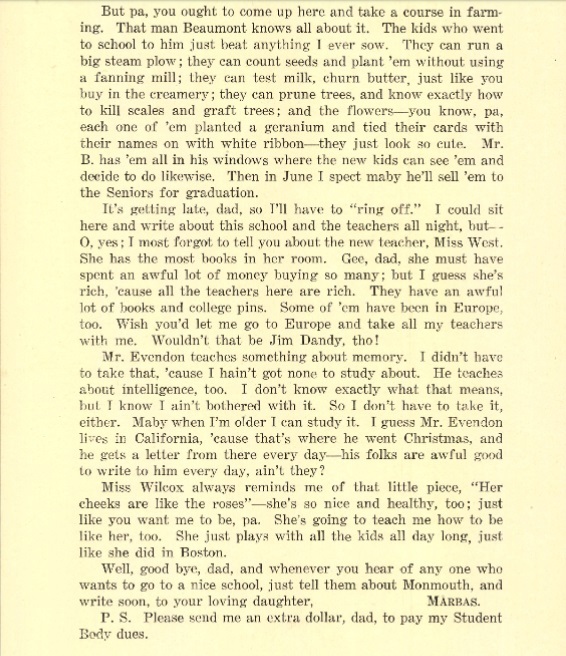 Programs on Friday, November 3, 1911 included roll call, musical pieces, readings, orations, and book reviews. Other activities that might have been included in regular programs were debates, skits, and discussions of current events and social reform topics. Participation in regular programs helped students develop organizational skills, public speaking abilities, strong critical thinking, abilities to shape arguments, understanding of current events, confidence in formal settings, and experience with systems like voting. These experiences helped rural women develop comfort and poise in a setting that reflected that of an adult women’s club or a parent group for a school. With these experiences behind them, women were prepared to be active members among high-society groups such as women’s clubs and potential school donors. “Oregon Normal,” Independence Enterprise, November 5, 1920, 1. The week of November 5, 1920 was recognized by educators across the United States as “Better Speech Week,” a movement to encourage proper speech in classrooms. 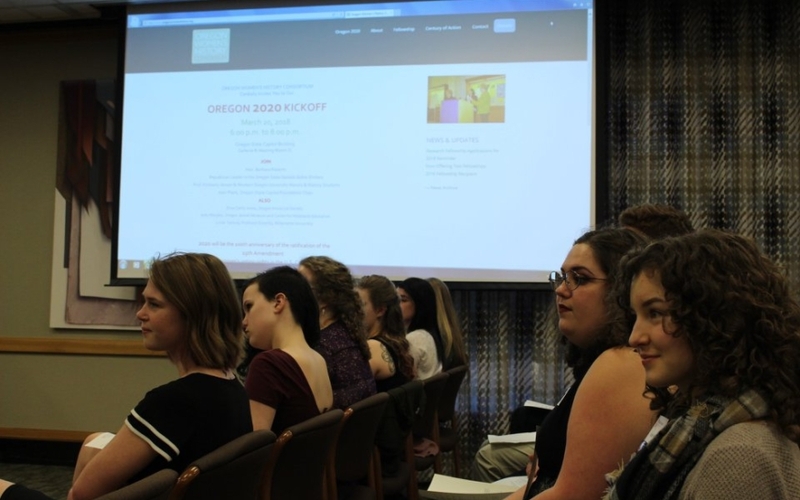 Students at Oregon Normal School organized activities, and the Vespertine society put on a program at the end of the week featuring a skit about correct speech. This event brought together ONS students, the local community, and educators across the country. 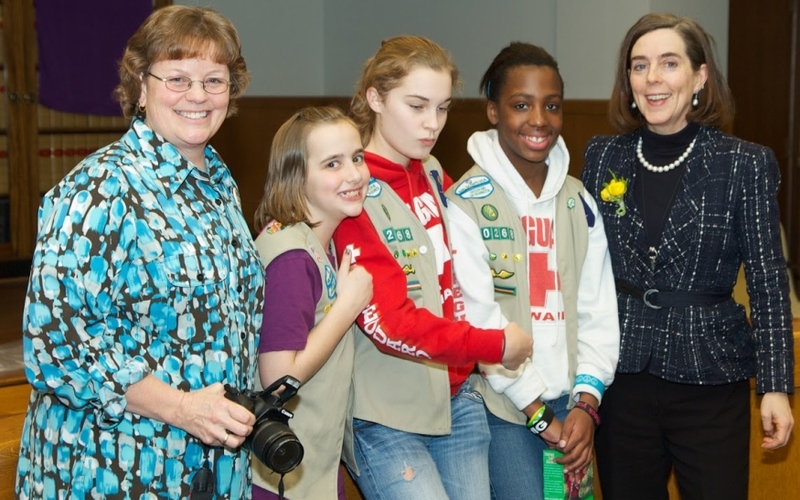 The community engagement and nationwide connectedness of this event mirrored the workings of women’s clubs. Through events like “Better Speech Week,” students gained experience and skills that would eventually allow them to be active women’s club participants. With backgrounds in event planning and community engagement, teachers were well-equipped to organize fundraising and other enrichment events to improve their schools and to support women’s advancement through involvement in clubs. With women expanding their role in the public sector and statewide support of education, the predominantly female profession of teaching gave young women from rural and working-class backgrounds an opportunity to contribute to the positive changes being made in society during the early 1900s. Experiences in normal school extracurriculars transformed students from wide-eyed “country girls” to reputable teachers by presenting them with opportunities to understand the changing world around them and participate in formal events. Through this process, enthusiastic women like Marbas, who would have otherwise been left out of women’s clubs and other influential positions, became community leaders with the skills to improve their positions as women and as educators. 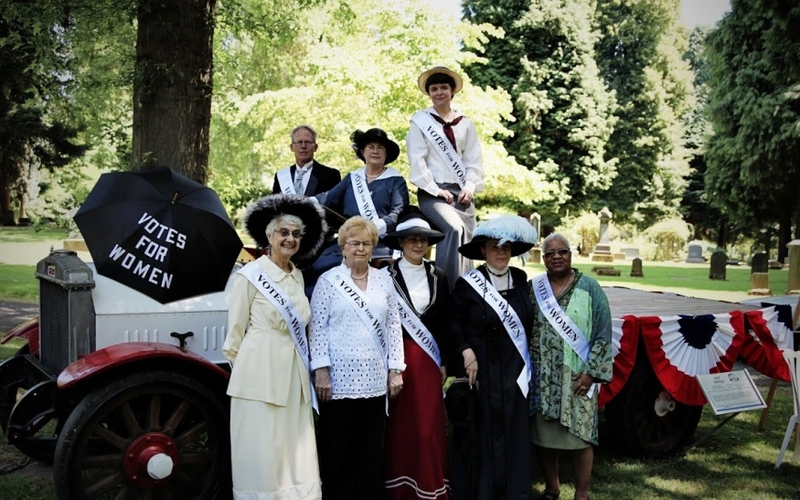 In the midst of the Oregon and national woman suffrage movements, teachers’ positions were of great importance, creating inclusivity, opportunity, and power as women from diverse backgrounds got involved in the fight for the vote and other social advancements. 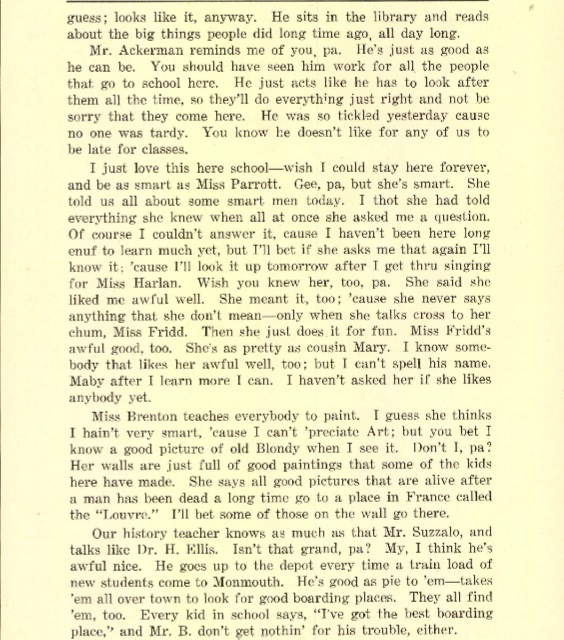 Oregon Normal School, “The Norm, 1912-04” (1912). The Norm: 1911 – 1939. 4. 36-38. Blair, Karen. Normal Schools of the Pacific Northwest: The Lifelong Impact of Extracurricular Club Activities on Women Students at Teacher-Training Institutions. Seattle: University of Washington, 2009. 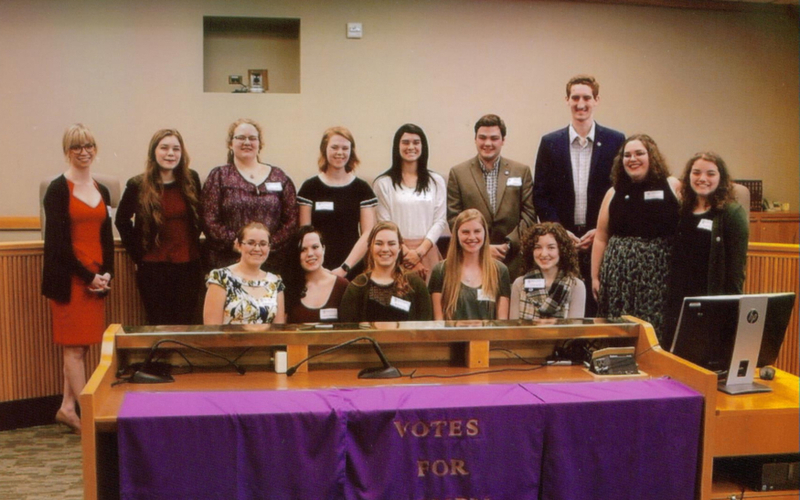 Rachel Bayly participated in Professor Kimberly Jensen’s Winter 2018 Women’s Suffrage course as a student in Western Oregon University’s Honors Program. Rachel is an Interdisciplinary Studies major with focus areas in early childhood education, social sciences, and psychology.